Photos from our first game at Cold Wars 2017 using Et sans résultat! (ESR) Second Edition. 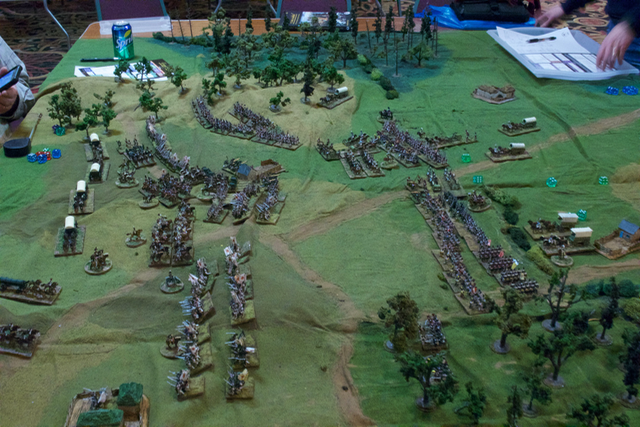 It was a four player game, each running the bulk of a corps, staged in 1812 (fictional). We played a little over 20 turns in about 3.5 hours – so 7+ hours of "battle time" represented. It was a bit of a stand-off as the French developed their attack… and then the Russian center collapsed. The Russian hussars, having rested after an opening combat with the French light cavalry of Ney's III Corps, plunged into the gap and bought the Russians some stabilization. But they were completely worn out afterwards. With the center broken, Russian withdrawal with imminent. More photos and an AAR in our gallery.